Oatmeal is a nutrient-dense breakfast, whether you consume it dry or cooked. It contains a type of soluble fiber called beta-glucan that may help you control your blood sugar levels and lower your risk for high cholesterol, cancer and obesity, according to an article published in "Comprehensive Reviews in Food Science and Food Safety" in July 2012. The difference in calories and macronutrients between 1 cup of cooked oatmeal and 1 cup of dry oatmeal is mainly due to the higher water content of cooked oatmeal. It only takes 1/2 cup of dry oatmeal to make 1 cup of cooked oatmeal. Each cup of cooked oatmeal has 166 calories, 5.9 grams of protein, 3.6 grams of fat and 28.1 grams of carbohydrates, including 4 grams of fiber, or 16 percent of the daily value. A cup of dry oatmeal has 307 calories, 10.7 grams of protein, 5.3 grams of fat and 54.8 grams of carbohydrates, including 8.2 grams of fiber, or 33 percent of the DV. While some types of oatmeal are enriched or fortified to provide more vitamins, the only vitamin provided in significant amounts in unenriched oatmeal is thiamine. A cup of cooked oatmeal has 0.18 milligram, or 12 percent of the DV, and a cup of dry oatmeal provides 0.37 milligrams, or 25 percent of the DV for thiamine. Thiamine is essential for brain and nervous system function. While you might expect a cup of dry oatmeal to have double the amount of minerals as a cup of cooked oatmeal, this isn't necessarily the case. A cup of dry oatmeal has 19 percent of the DV for iron, 28 percent of the DV for magnesium, 33 percent of the DV for phosphorus, 20 percent of the DV for zinc, 16 percent of the DV for copper, 147 percent of the DV for manganese and 33 percent of the DV for selenium. Cooked oatmeal has 12 percent of the DV for iron, 16 percent of the DV for magnesium, 18 percent of the DV for phosphorus, 16 percent of the DV for zinc, 9 percent of the DV for copper, 16 percent of the DV for manganese and 18 percent of the DV for selenium. Iron and copper are essential for forming red blood cells, and magnesium, phosphorus and zinc are all needed for forming DNA. Manganese and selenium are both antioxidants that help prevent cell damage caused by substances called free radicals. 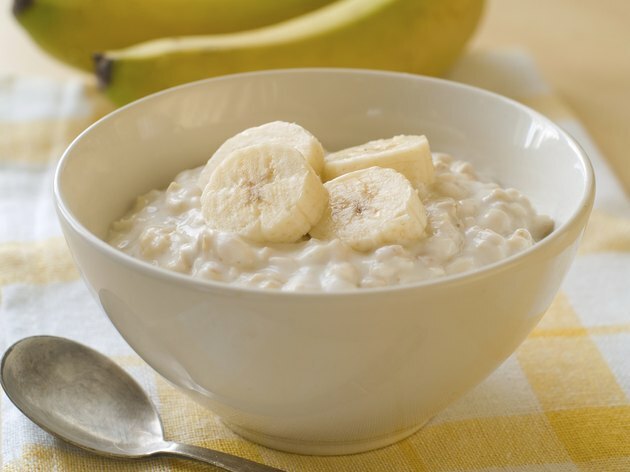 While rolled oats, quick oats and instant oats have about the same nutritional value, their effects on blood sugar vary. The more processed a food is, the higher its glycemic index, meaning the greater the effect on your blood sugar levels. Rolled oats have a low glycemic index, quick oats have a medium glycemic index and instant oats have a high glycemic index, according to the American Diabetes Association. Fitness Magazine: Is the Lower-Calorie Choice Always Better? What Are the Health Benefits of Grits Vs. Oatmeal? How Much Protein Is in Oats?